People throughout the world have used the Berkeley Lab Detector circuit board to detect cosmic rays. As you can see from these links, there are many designs and ways to assemble it. We are collecting these descriptions so that others can get some good ideas. The authors of the articles deserve full credit and responsibility for the work that they created. We welcome any other submissions. 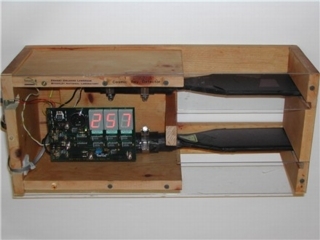 Mehmet Bektasoglu and Halil Arslan from Sakarya University in Turkey wrote a second article using their detector. This one appears in the Pramana Journal of Physics and is called "Investigation of the zenith angle dependence of cosmic-ray muons at sea level". Mehmet Bektasoglu and Baris Tonguc from Sakarya University in Turkey wrote an article in the Arabian Journal for Science and Engineering whose title is "Estimation of the Most Probable Muon Energy at Sea Level Using Two-Paddle Cosmic Ray Detectors". The board was used to measure the variation of cosmic rays during a train trip in Japan. The Scottish Science and Technology Roadshow built several detectors. This page shows a measurement by Holly Batchelor of the angular dependence of cosmic rays. Greg Poe, a student at Travis High School in Richmond, Texas, received an honorable mention at the 2009 Houston Science and Engineering Fair. Sean Fotrell relates how he used the Fermilab Cosmic Ray Detector to measure the lifetime of the muon. He also describes how he and his students took the Berkeley Lab detector on a field trip up Mt. Diablo to measure the cosmic ray flux. Francisco Barradas-Solas, who teaches high school in Spain, published an article on building a cosmic ray detector in the journal Physics Education. He used the Berkeley Lab circuit board together with spare parts from CERN to build a detector for the Madrid for Science Fair. Josie Herman of Mc Gill University built a detector with the supervision of Professor David Hanna. She wrote a report which describes how she built the detector. She studied the pulse height of the scintillators and measured the warm up time. Finally, there is a very nice measurement of the cosmic ray flux as a function of height in a 4 and 12 story building. There are numerous and very useful equations in this document. Josie took this detector to the New York Schools Cosmic Particle Telescope workshop. Ken Cecire has created a web page which describes several different ways of building cosmic ray detectors. The Berkeley Lab Detector traveled to the South Pole under the guidance of Eric Muhs, a physics teacher at Roosevelt High School in Seattle. In his journal, he describes his very own detector. Workshop on Cosmic Ray Physics with School-Based Detector Network -Seattle 2000. Jerry Kahn of Lawrence Berkeley National Laboratory wrote an article on cosmic rays, astronauts' health, and travel to Mars. Fred Nelson, a QuarkNet teacher from Kansas State University, has used the Berkeley Detector circuit board at his QuarkNet workshop. His web page has a number of interesting links. Mark Pierece and Stefan Rydström have designed a detector where the distance of between paddles can be changed. Professor Julia Thompson from the U. of Pittsburgh has a page that describes here QuarkNet work with cosmic ray detector. On that page, Gene Bender describes his work with the Berkeley Detector. She has written a note on some tips for expanding the detector. Eric Muhs has taken the Berkeley Detector on a road trip and on a balloon. He has created a web site showing his results. There is even an animated movie showing how the detector works. At the 2003 PAN - Physics of Atomic Nuclei Workshop at Michigan State University, students built and tested several cosmic ray detectors. Mark Pearce and Stefan Rydström from KTH Partikelfsik describe their project. Bart Royeaerd described his experiences with the detector. He has a much more detailed report, which is written in Dutch. Contact him if you want a copy. Another way to use a cosmic ray detector is to take it into a tunnel or a mine. Bob Coutts has built a comic ray detector and measured the attenuation of muons in several tunnels. He has also written a manual on how to use his design. A technique similar to what Bob did, has been done to determine if there are hidden chambers in a pyramids. Henry Cheng, one of the first students to work on the Berkeley Cosmic Ray Detector, developed his own tutorial. This design was modified, but much of the instructions are current. Radman Zarbock, from the Atheniun School in Danville, has done several interesting experiments with the Berkley Cosmic Ray Detector. These include studying the cosmic ray flux in a building and measuring the the flux as one climbs a mountain. If you created any written material with the Berkeley Lab Detector and want it displayed on this web page, please send it to Howard Matis.